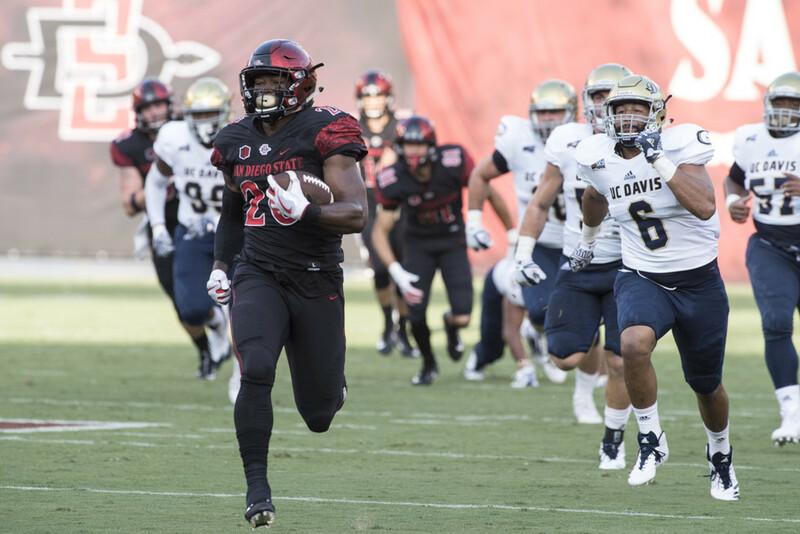 In the week where San Diego State football running back Rashaad Penny was named the Mountain West player of the week for the seventh time this season and ninth in his career — a school record, he was snubbed by two major awards. “Anybody that follows our program think it’s not right, but not many people nationally follow our program,” Aztec coach Rocky Long said. Penny is arguably one the best running backs in the nation this season, but he was not named as a finalist for the Doak Walker Award, which goes to the best running back in the country. Instead, the finalists are Bryce Love of Stanford, Saquon Barkley of Penn State and Jonathan Taylor of Wisconsin. Penny was also snubbed by the Maxwell Award for best college football player, which named Love, Barkley and Oklahoma quarterback Baker Mayfield as finalists. Penny had a record 429 all-purpose yards in the win against Nevada last weekend, breaking a 26-year school record held by Marshall Faulk. He had 222 yards on 24 carries for two touchdowns and added 201 more yards on two kickoff returns and one punt return for a touchdown. Penny’s teammates are equally incensed about the national snub. Penny is still a semi-finalist for the Walter Camp Award, which goes to the nation’s best player. The finalists for that award will be named next week. And there’s still the Heisman Trophy award, but Long isn’t hopeful about that. Which explains why SDSU hasn’t launched a Heisman campaign for Penny as it did for Pumphrey.